Romans 8:17 tells us that we suffer with Christ to be glorified with Him. Faith and love energize us to pass through the sufferings that bring us to the glory to be revealed at the Lord’s second coming and then to the glory of New Jerusalem. Faith and love are two inseparable, excellent virtues of the believers in Christ. Faith is given to us by God (2 Pet. 1) that by it we may receive Christ (John 1:12), the embodiment of the Triune God (Col. 2:9), and thereby enter into the Triune God and be joined to Him as one, having Him as our life, life supply, and everything. Love issues out of such a wonderful faith and enables us to live out all the riches of the Triune God in Christ with those who have believed into Christ with us, that the Triune God — the Father, the Son, and the Spirit — may have a glorious expression. 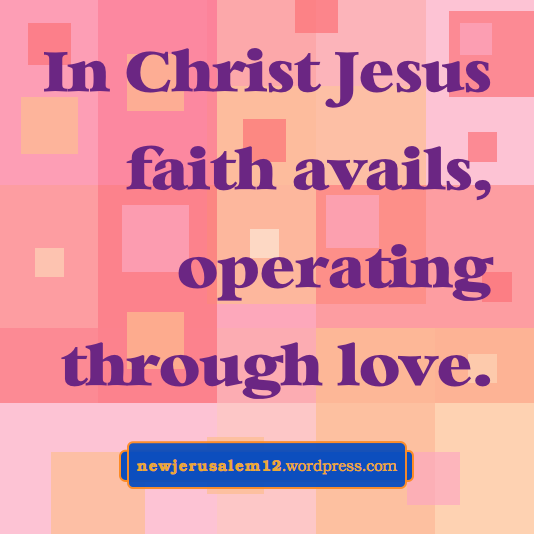 Faith and love are excellent because they unite us with the Triune God. The Triune God as our life and living result in a glorious expression present now to a limited extent. This expression will be much more in the coming age and at its fullest in New Jerusalem. New Jerusalem is the city of glory. To prepare the way unto this eternal city, Jesus Christ will come again in glory and we will be glorified with Him. Our glorification with Him involves suffering with Him now. The way to pass through the present sufferings is by faith and love. Faith substantiates the unseen, eternal glory, and love draws us to the Lord whom we have not seen. 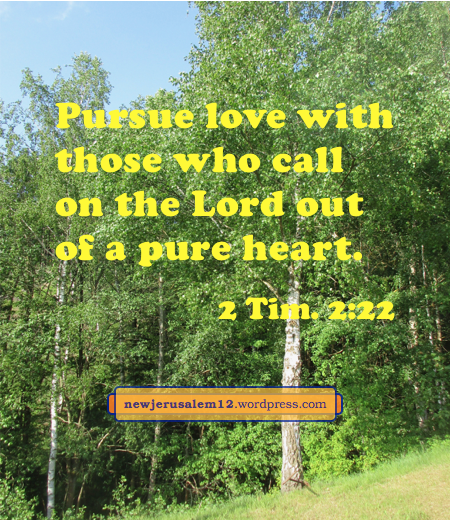 To encourage us on our path toward New Jerusalem, here are a few more verses on faith and love. 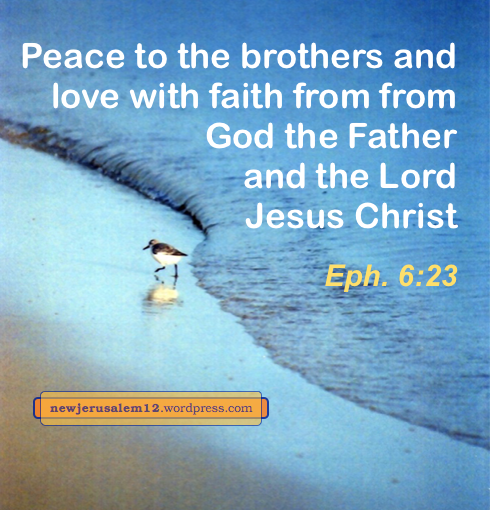 Ephesians 6:23 blesses us, “Peace to the brothers and love with faith from God the Father and the Lord Jesus Christ.” Again love and faith are joined, and they come from our Father and our Lord. They do not originate with us. Only what is from the divine source can bring us to New Jerusalem. Paul had not been to Colossae but he says, “we have heard of your faith in Christ Jesus and the love which you have unto all the saints” (1:4). Thank the Lord for this expression of faith and love in humanity. There will be much more in New Jerusalem. * Part of footnote 2 on Gal. 5:6 in the Recovery Version NT; footnotes written by Witness Lee. In Revelation 21:2 John tells us, “I saw the holy city, New Jerusalem, coming down out of heaven from God, prepared as a bride adorned for her husband.” This is in eternity, in the new creation (21:1). In Revelation 22:7 the Lord says, “Behold, I come quickly.” In 22:12 He says “Behold, I come quickly, and My reward is with Me to render to each one as his work is.” In 22:16 He says further, “I Jesus have sent My angel to testify to you these things for the churches.” These verses in Revelation 22 show us that the concluding words of the Bible are before eternity. They are for us now, in the church age, before our Lord comes again and before the believers are gathered to His judgment seat (1 Cor. 4:5, 2 Cor. 5:10). Although Revelation 21:2 presents New Jerusalem as the bride in the new creation, even before the Lord’s second coming, the bride is functioning. 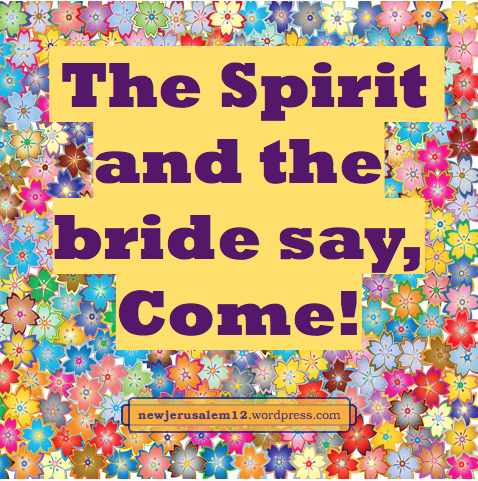 This is seen in Revelation 22:17, “The Spirit and the bride say, Come!“. This appeal expresses the desire for the Lord to come again. Lord Jesus, we love You and we love Your appearing. Lord, come quickly! 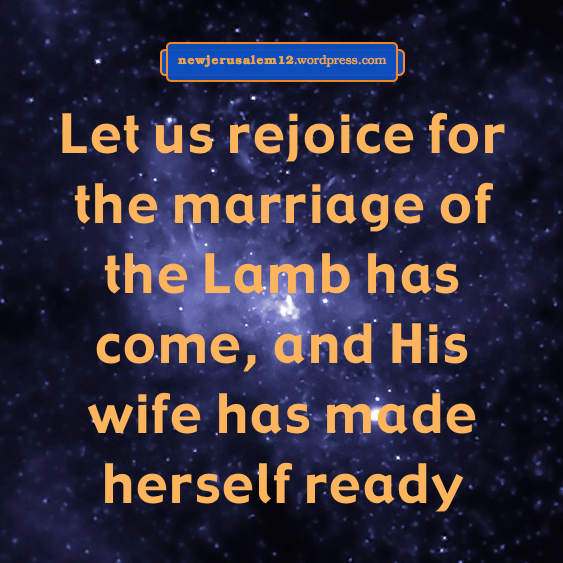 New Jerusalem is “the bride, the wife of the Lamb” (Rev. 21:2, 9). This marriage is foreshadowed by Christ and the church, presented in the context of human marriage in Ephesians 5. This relationship is in love. Here is a link to each post about this relationship in Ephesians plus a verse from each. The last four links are for a song about Christ’s love for the church. 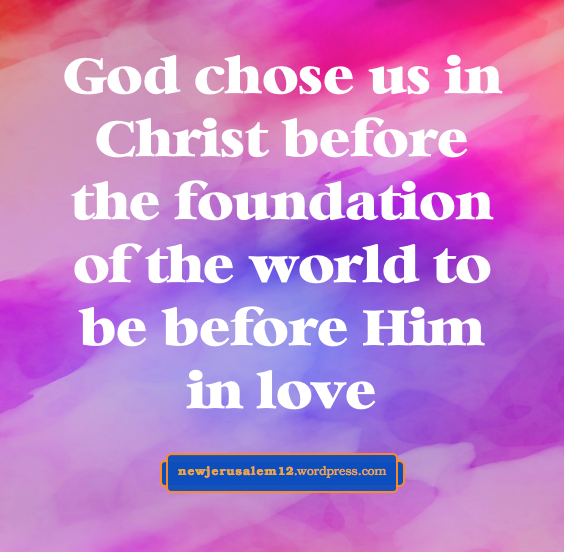 Last month there were six posts from Ephesians on the love between Christ the Husband and His wife the church (now) and New Jerusalem (eternally). My most recent post was the Lord’s rebuke to Ephesus in Revelation 2 because of their loss of the first love to Him. 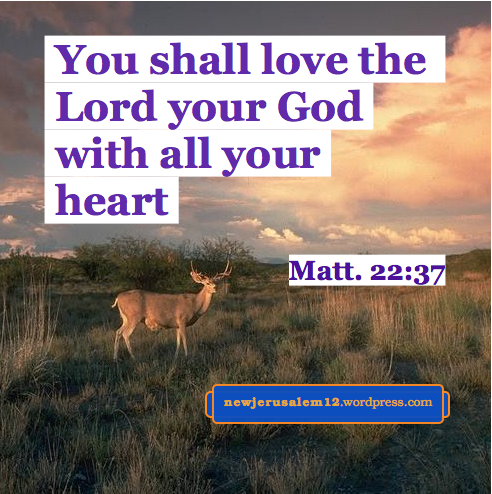 How did they lose this love while remain-ing very active for the Lord in many things? First Timothy 1 gives us a view. Then Paul says “the end/goal/purpose* of the charge is love out of a pure heart and out of a good conscience and out of unfeigned faith” (v. 5). 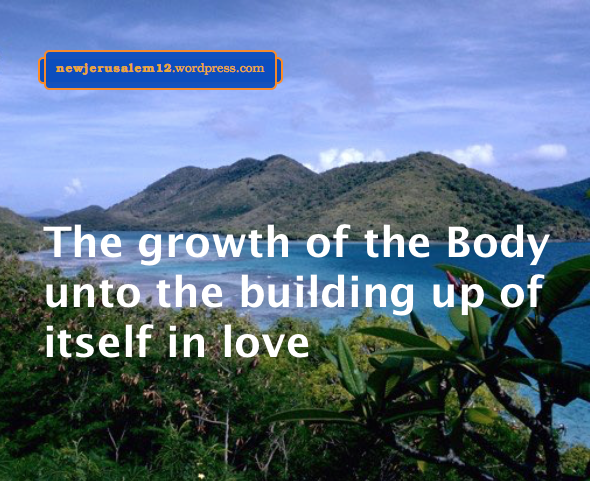 These three inward sources of love make for a proper church life and prepare us for New Jerusalem. Lord Jesus, I love You! Save me from all the distractions to remain in Your love. * Various translations in 1 Tim. 1:5, thanks to Bible Hub.